From sunrise to sunset you can enjoy the many activities Ocean Pointe has to offer or just relax in your oceanfront suite and surround yourself with our tranquil environment of sixty acres of tropical elegance in the Fabulous Florida Keys. Your vacation begins the moment you drive through our gatehouse entrance into our beautifully landscaped tropical grounds and enter your spacious one or two bedroom suite. Your accommodations will include a fully equipped kitchen living/dining room and a private balcony. After enjoying a convenient breakfast in our full service waterfront cafe use our free lighted tennis facilities- swim in our huge heated pool- sunbathe on our private beach- rent a kayak- or just take a walk along our private boardwalk and marina. The marina and boat ramp are capable of handling craft up to 28ft. Contact hotel for current Marina rates and availibility. Fine restaurants and shopping are just minutes away along with boating- fishing- snorkeling- diving- Everglades eco-tours- glass bottom boat reef trips- parasailing- waverunners- and swimming with the dolphins. Everything you could want for the perfect Keys vacation. 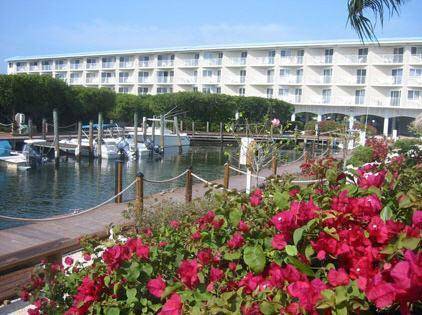 A great deal at our special ocean front paradise and we do not charge any resort or vehicle parking fees.